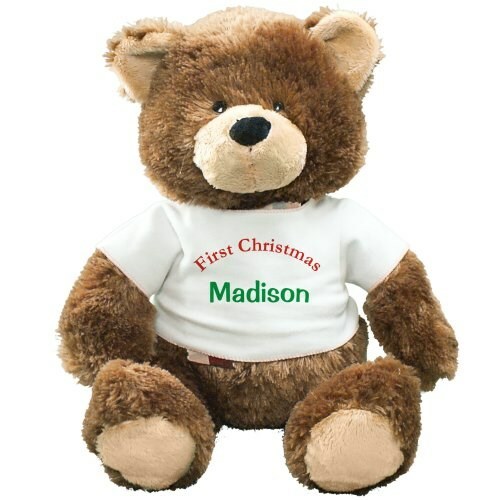 Personalized First Christmas Teddy Bear - 20"
Commemorate a first Christmas with this lovable Plush Teddy Bear. A Plush Teddy Bear for Christmas is a unique gift to cherish each and every year. This lovable teddy bear is a classic, soft and furry Gund Bear with rich dark brown fur and contrasting tan fur on its snout, ears and feet. A red bow tied around its neck gives it a wonderful look to enjoy always. This Plush Teddy Bear measures 20”. Free personalization of any name is included. Free Gift Card and Free Gift Wrapping are included to create a thoughtful presentation.